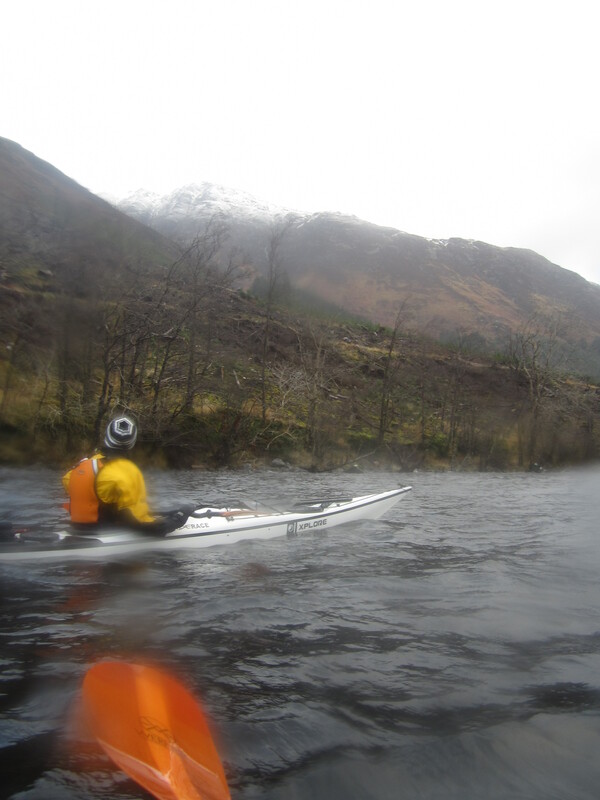 Report: The route follows the Caledonian Canal and full details can be obtained at Great Glen Canoe Trail. 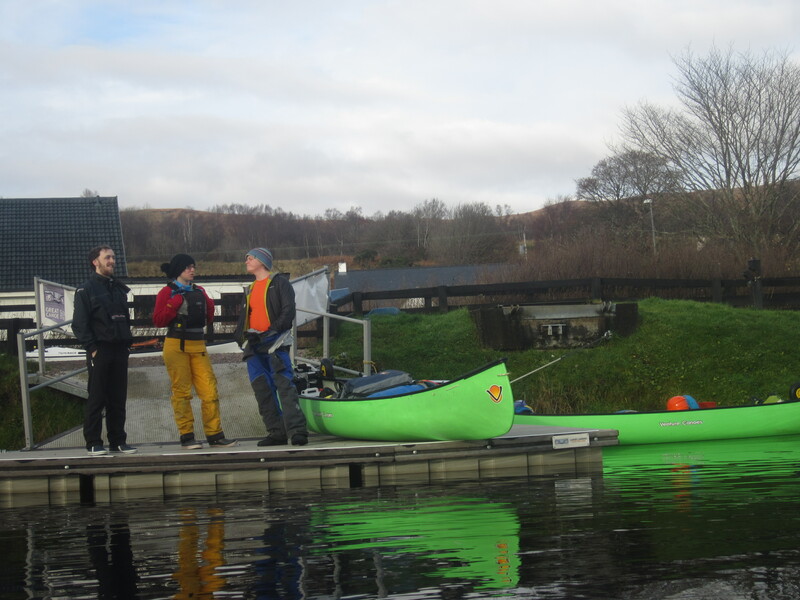 We started at the top loch at Banavie (Fort William), where low pontoons have been constructed for easy entry and exit from canoes. Exit from the sea kayaks is more problematic; akin to exit at the Pool. The weather was quite pleasant, cold but with occasional sun. The canal itself is excellent paddling, wide and attractive with stunning view over to Ben Nevis and the Grey Corries. 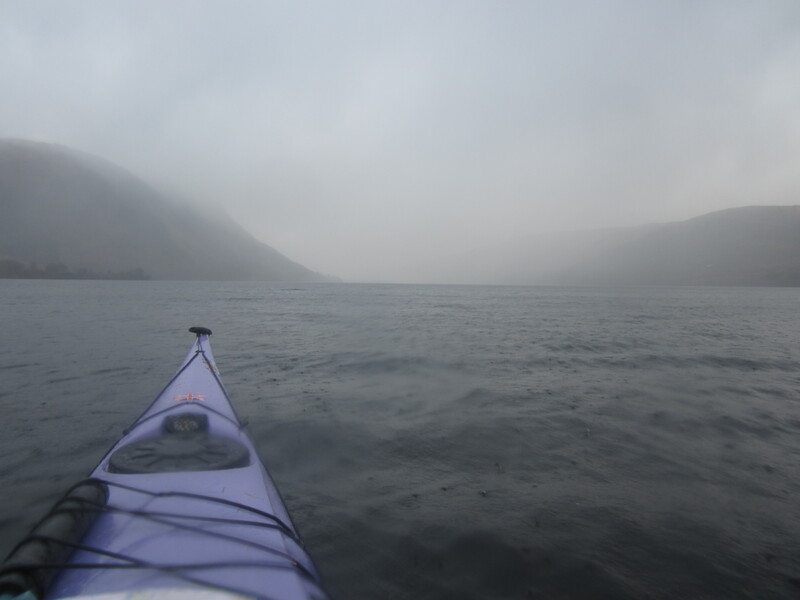 Whilst we had expected the cold, it was the very short days, often gloomy, that had the most effect. We really needed to have sorted out a campsite by 3.30 and, after the shuttle run with the cars, rarely left before 10am in the morning. 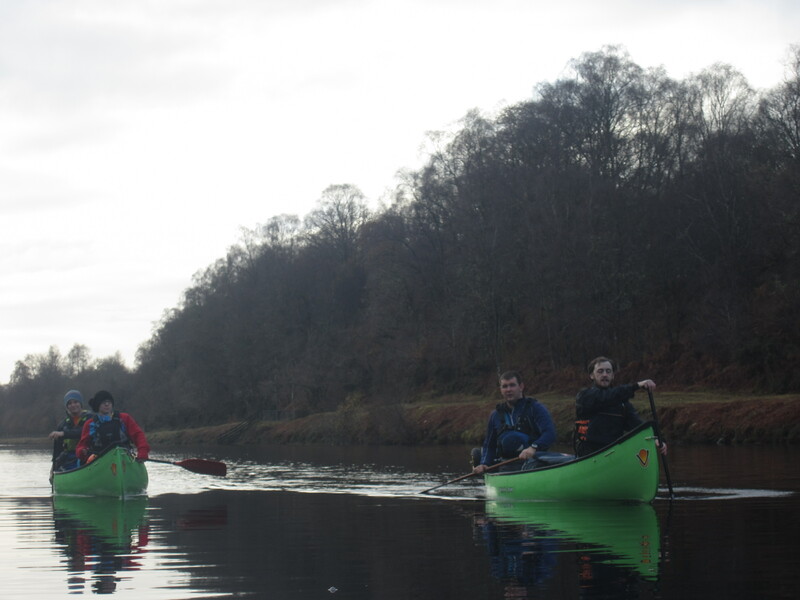 The curtailed day meant that the full trip to Inverness was simply not feasible in canoes. 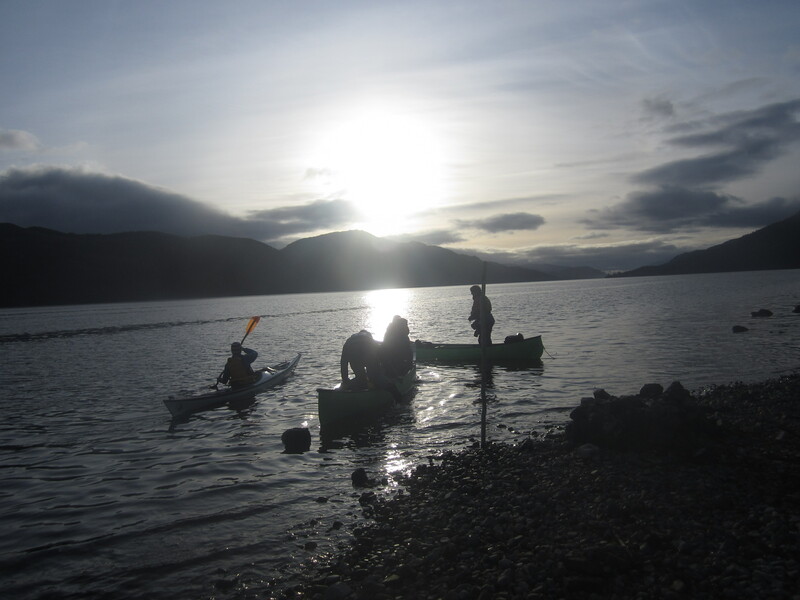 Our first camp site was the informal one at the far end of the long portage at Gairlochy Lochs. 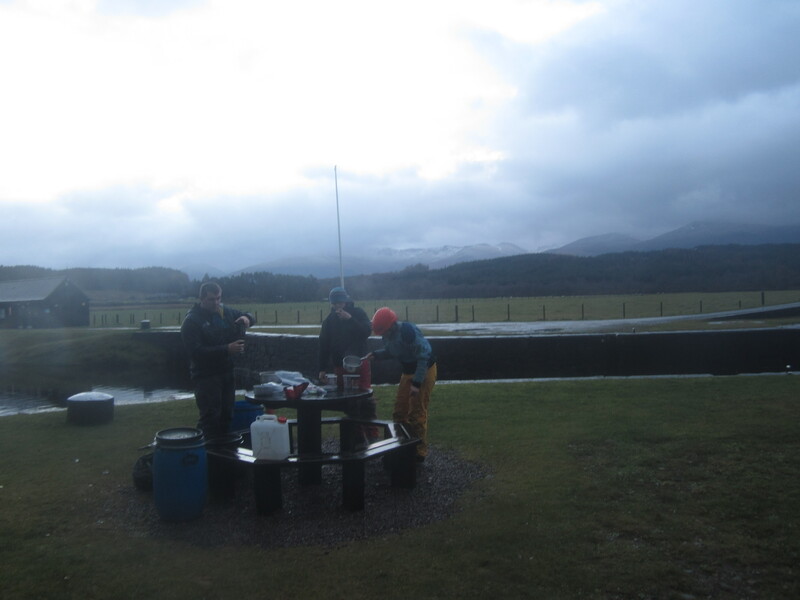 The toilet block (with piping hot water!) was close by. We paid £5 each for a key to these facilities for the period of our trip. In addition there was a good wood supply and although the temperature was dropping rapidly a good evening was had until the rain set in at 8.30. It rained incessantly and squalls hit the tents despite our sheltered position. Meanwhile the temperature dropped to zero. Not the best of nights for some of the party. With a degree of unwillingness to leave sleeping bags we did not get away until around 10am. The wind, which had been SW had swung northward and strengthened to force 5 with squalls of force 7. Meanwhile the continuous rain was complemented by periodic downpours. 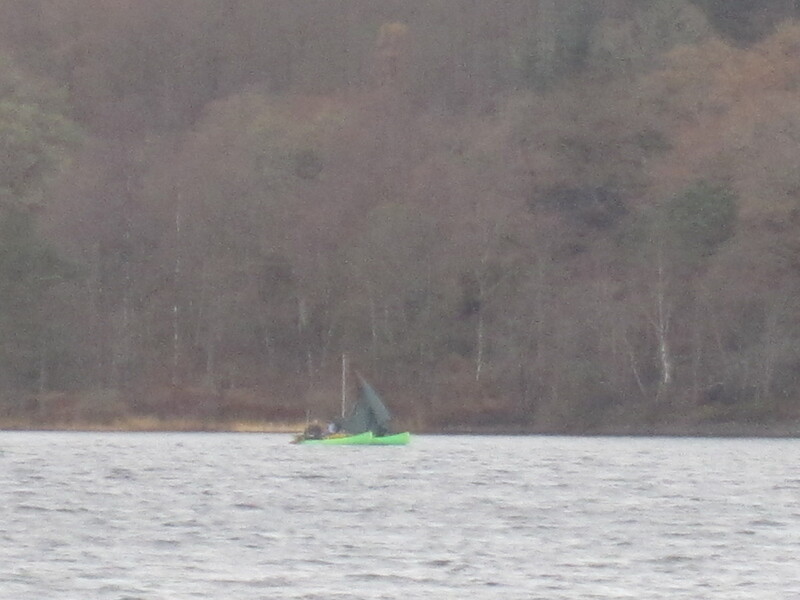 The canoeists, meanwhile were trying to erect a sail on a catamaran formed from the two boats. 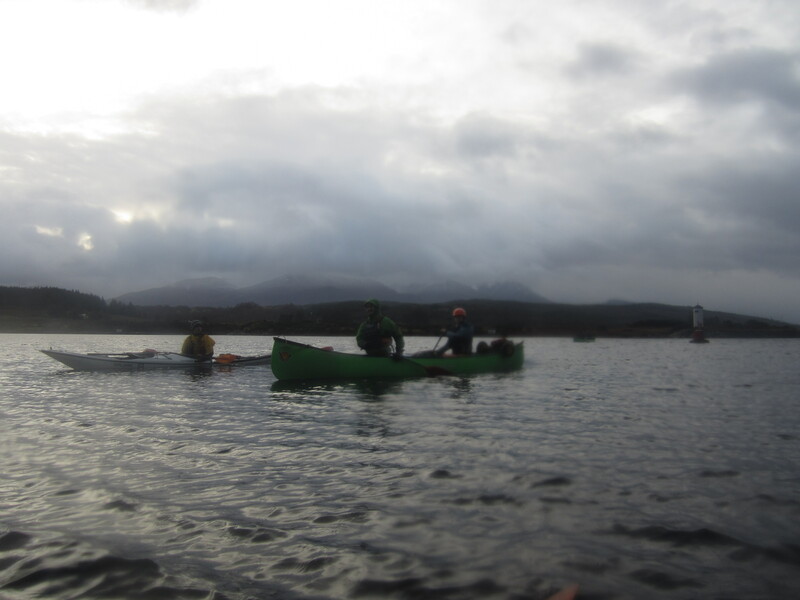 Unfortunately the squalls were too strong and the canoeists simply skudded up the Loch in the wind until South Laggan Locks were reached. Unlike Gairlochy, South Laggan provides little real shelter from the wind and little wood. The informal camp site is some way from the toilet block and its life saving radiator and hot water. A long not very pleasant night could be forecast. A decision was made to find a pub for the evening and three of the group defected to a hostel in Fort Augustus. 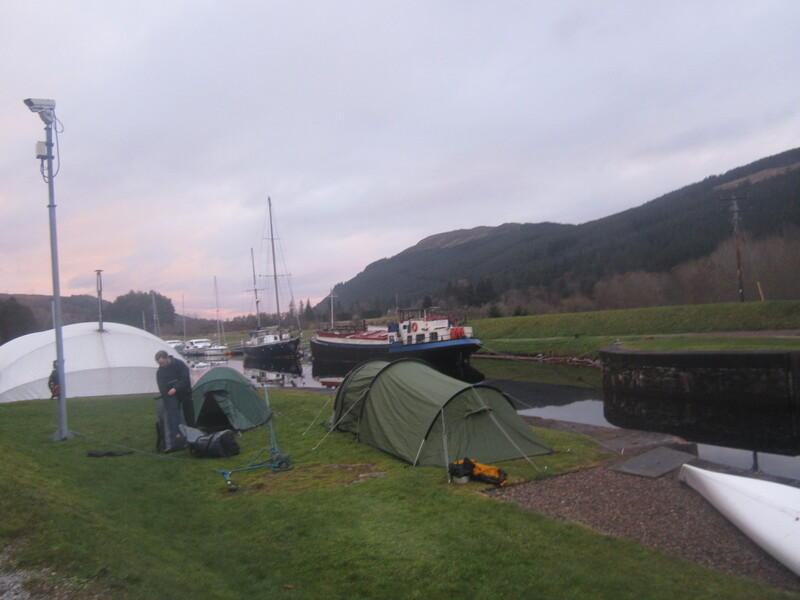 The others camped on the canal bank by the toilet block in one of the few sheltered areas. After another cold night the following day was much improved. Still grey and cold the wind had swung back to the south west and was much lighter. The route led up the canal for a couple of kilometers, under the swing bridge at North Laggan and out onto Loch Oich. 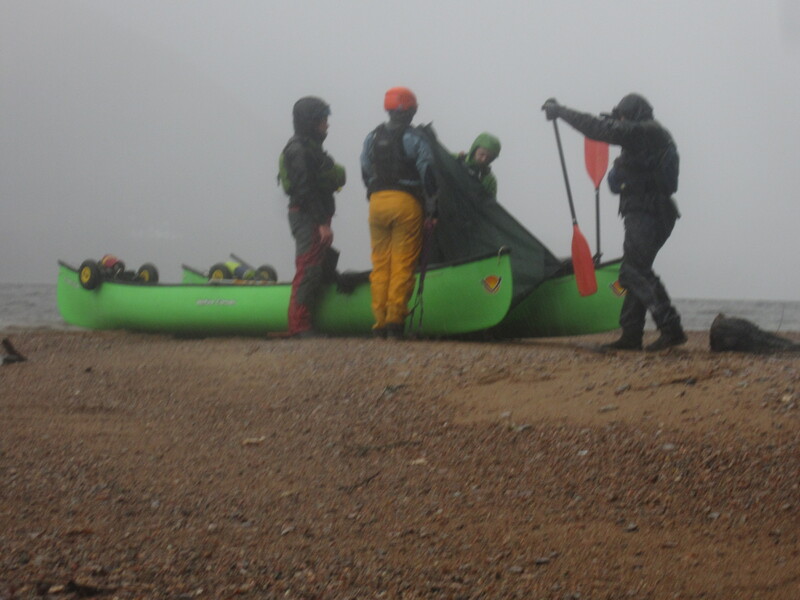 The canoeists eventually managed to rig a sail and for the first time managed to keep up with the kayakers. At the end of the loch the routes diverged. 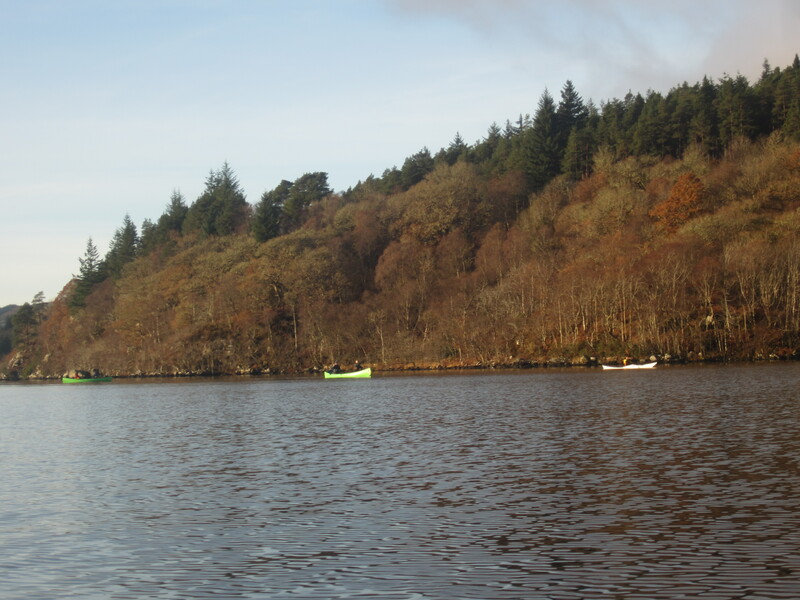 The kayakers, anxious to avoid any damage to their composite boats opted for the canal, whilst the canoeists took the plunge down the River Oich. Although progress on the canal was good the two portages meant the kayakers reached Fort Augustus almost an hour later than the canoeists. 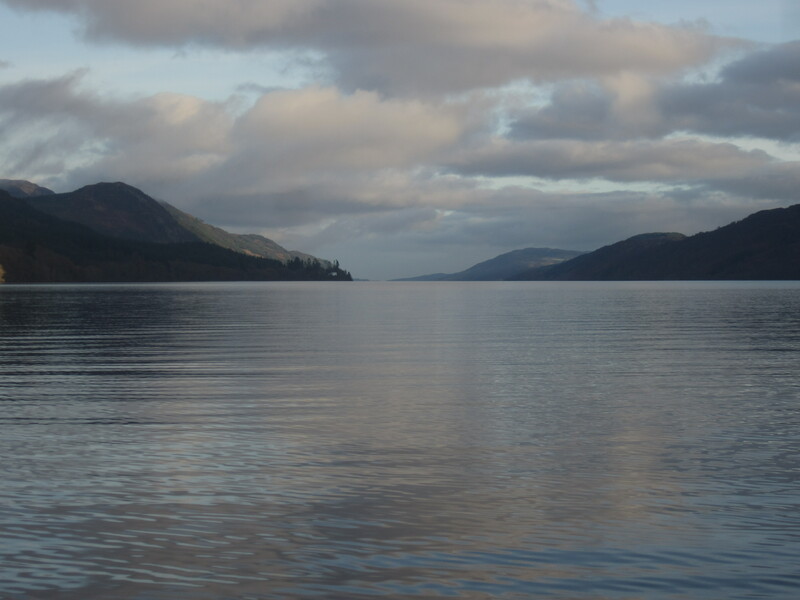 There is no loch-side camping at Fort Augustus and no road access to the informal site a few miles up on the east side of the loch (necessary for the car shuttle). We thus all made the decision to use hostel accommodation for the night. A shower, food and pub followed. Sunday had the best weather of the trip with a lot of sun providing some heat and just the lightest of south westerly breezes. An extensive debate ensued between those wanting to push on to Drumnadrochit and those who simply thought we could not make it in the light. Foyars was possible but the car shuttle time ruled it out. In the end we decided to leave the cars at Invermoriston, paddle on past towards Foyars and then return back to Invermoriston. We made excellent progress in the bright sun and pulled up for lunch some 3km north of Invermoriston. After a prolonged lunch the cold started to creep in again and we decided to make tracks back to Invermoriston. The car was parked in the village and we attempted to paddle up the river to get as close as possible. Sadly after the hydro barrage the river is impassable so we set off south to find a place close to the road where we could load. We eventually found a place about 1 mile south of the village. After Collection of cars from both Invermoriston and Fort Augustus and packing cars and trailer we were off homebound around 3.30. This is a lovely, if unexciting paddle. The cold and darkness were the real challenge. We had the wind behind us every day; to go against it would be a nightmare. Whilst facilities are good, parking and camping is limited. In winter you can get away with camping on the canal edge. You need to get away early each morning which means setting up the car shuttle the night before if at all possible. 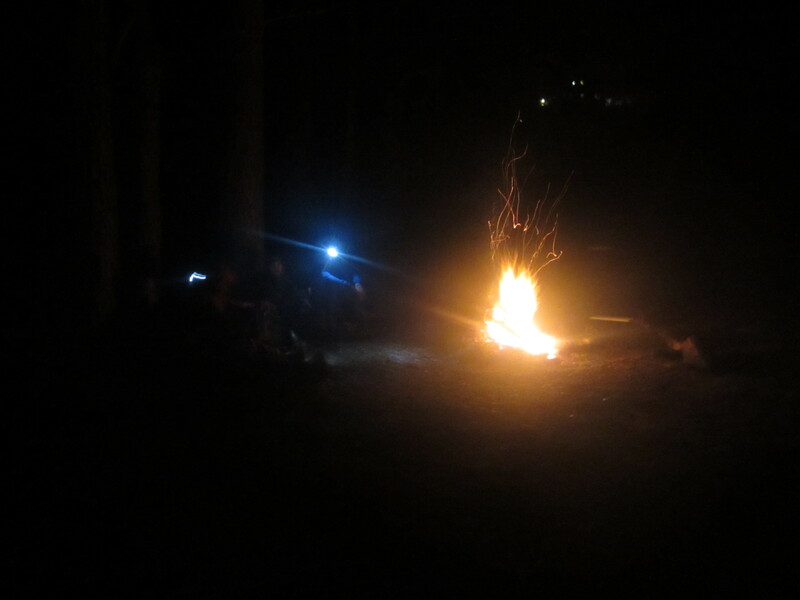 You do not want to get out of the tent when it is both very cold and dark. 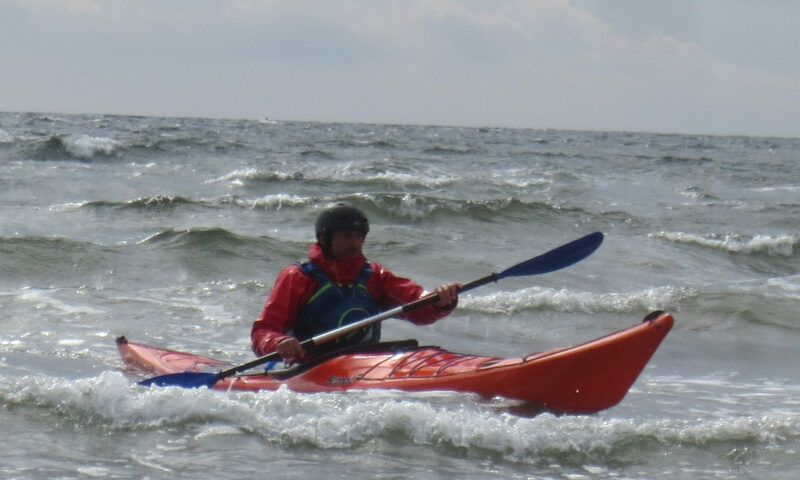 Canoes are sociable and carry big loads but are at least 25% slower than sea-kayaks. In conclusion this was a very successful trip that could have been improved. If you are thinking of doing it in midwinter, plan very carefully with someone who has done it before and can give advice.